I am very proud to announce the publication of two teacher resources called Mastering the Facts – Addition and Mastering the Facts – Multiplication. Created in collaboration with the Campbell River School district, these resources combine my work with the work of teacher leaders in elementary schools in Campbell River. We wanted to put together a set of lessons that could be used in classrooms across the province to help students truly master – and not just memorize – their basic facts. Each book includes a set of lessons describing each of the facts, both addition and multiplication. Featuring strategies like “doubles”, “double doubles” and “bridging through tens”, the books make explicit connections to our WNCP curriculum and the mental math learning outcomes at each grade level. Each lesson features a direct instruction component and a “before-during-after” lesson frame. Guided practice, literature connections, real-world problems, independent practice (games) and fluency builders are also included. For each lesson, there is an assessment component to sort out what students know and can do. It evaluates in numbers, pictures, words, models and real-world problems the extent to which students have mastered the strategy – and also mastered the facts themselves. Games, line masters, literature links and assessment tools are included in the resource. 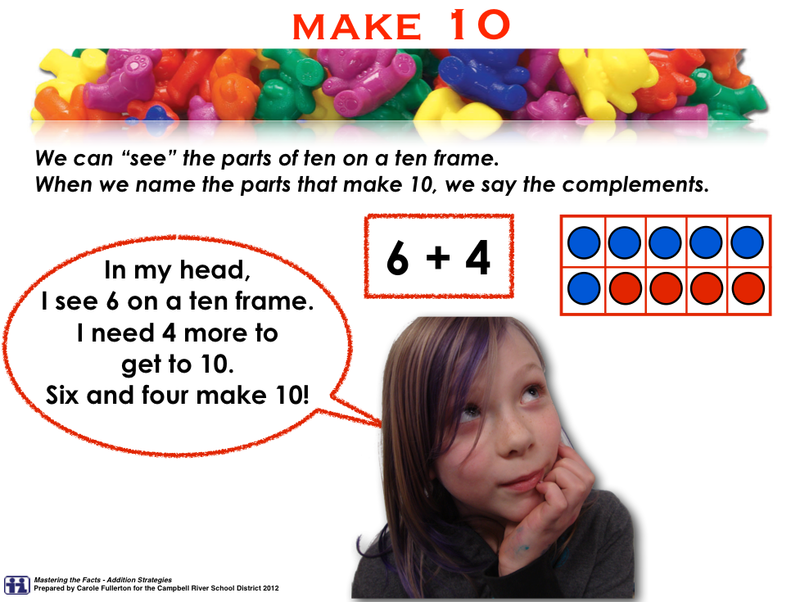 In addition to the teacher resources, a set of Addition Posters and Multiplication Posters are also available to describe – in pictures, and in students’ words – how each strategy is applied. There are 9 posters in the set, printed on 11″x17″ glossy bond paper. Although the books and posters are being distributed through the Campbell River School District, I am available – and happy! – to do professional development with school staffs and resource teams around the materials. This might involve a series of sessions with time scheduled in between to apply and try the strategies, or an overview session to learn techniques and practice the games… Books for participants would be made available for the sessions so we could speak to the lessons explicitly. I am very proud of these materials and of all the teachers who collaborated to produce them. Hello to my colleagues in Coquitlam! I wanted to share a template for a set of multiplication flash cards that are set up to be used by strategy. You’ll notice that in the attached multiplication fact cards file, each of the fact families appears in a different colour, to bring to mind the particular strategy that matches the fact. The hope here is that, like with Cuisenaire rods. the related colours will help to call to mind the relationships between the facts themselves. I recommend that students cut apart the cards and practice the facts by strategy, one at a time, as they learn and then recall them. Because the 5 facts are related to the 10’s fact, their colours are likewise related in the flash cards – yellow for the 5’s and orange for the 10’s. The 9’s are another fact related to ten. For the “multiply by 9’s” we think multiply by ten and subtract one group. The 9 fact cards are in a related colour as well – red for the 9’s and orange for the tens. As for the remaining colours, the 1’s facts are all in white to highlight their simplicity (What you see is what you get!! ), the square numbers are purple (for no other reason than purple is my favourite colour and the squares are my favourite facts!) and the last three remaining facts – the most complex ones to master strategically – are in pink. The facts that are the reverse of all of these (the commutative or “flip-around” facts) have been left uncoloured in the bottom left hand corner of the virtual chart, since if we master the coloured ones – and practice them both forwards and backwards – we will likewise have mastered these ones. You might choose to print and cut them out, or not.